You’d be hard pressed to find someone who thinks of New York City as prime real estate for grape vines. Nevertheless, a charity-driven urban farming project called Village Vines is working to turn the concrete jungle into a giant working vineyard. The ambitious viticulture movement started in 2015 when Devin Shomaker received a phone call from someone in Brooklyn. 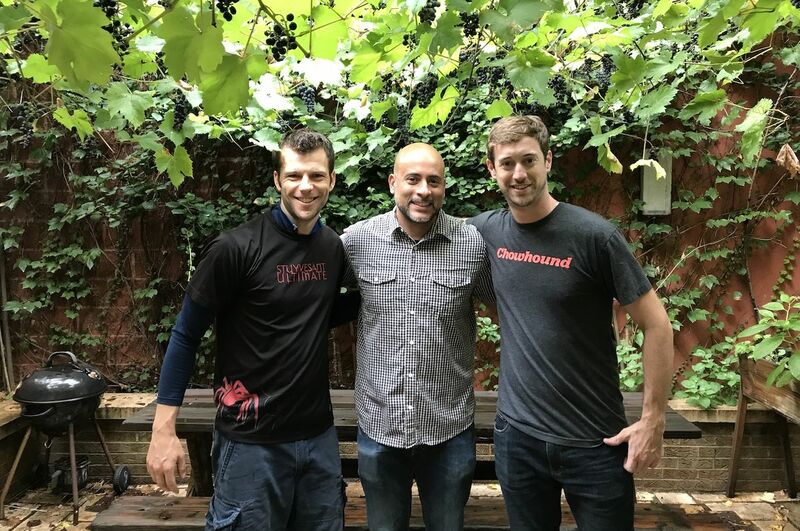 At the time, Shomaker was in the process of opening Rooftop Reds Vineyard in the Brooklyn Navy Yard. 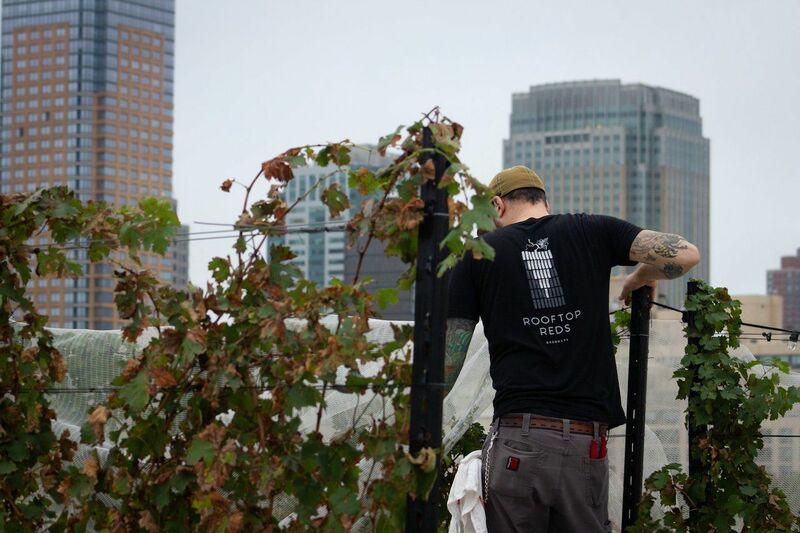 It’s the world’s first commercial vineyard and winery on a roof, complete with Bordeaux-variety grape vines and a view of the Manhattan skyline. Shomaker’s business venture inspired the Brooklyn caller to ask about any classes Shomaker might be offering on urban farming and winemaking. At the time, Shomaker had enough on his hands with his new business, but the idea stuck with him. Fast forward around three years. A beer bar called BierWax in the Prospect Heights neighborhood of Brooklyn was facing a grape problem on its patio. The vines were fine most of the year, but they created a mess as soon as the fruit started dropping to the ground in the fall — something owner Chris Maestro was warned of when he took over, he told amNewYork. To deal with the grapes, Maestro got in touch with Shomaker and Rooftop Reds, and in September of 2018, a team gathered at BierWax to harvest the vines. They managed to collect around 70 pounds of fruit in two hours. Village Vines officially had its first large haul of fruit. As the juice from the first harvest ferments, Village Vines is working on the process of incorporating. Malcolm Baker, the director of Village Vines, says they expect to earn 501c3 non-profit status in 2019. The ultimate goal is to work with residents and businesses to help grow vines around the five boroughs, like a person-to-person grape collective in the middle of the most densely populated city in the US. At the end of the season, Village Vines will harvest the grapes and the growers will hand over a list of their favorite local non-profits. A portion of the profits from the Village Vines wines will go to charities on that list. Village Vines currently has two methods of growth: the Heritage Vine Program and the Adopt-A-Vine Program. The former is like what happened at BierWax: viticulture experts from Village Vines teach people how to care for grape vines already growing on their property. The Adopt-A-Vine is for people or communities who want to be involved, but don’t already have the necessary plants. For a donation of $40-200, Village Vines provides a grape vine and a year of consultation services. Along with BierWax, the other companies that have expressed early interest in Village Vines include Nitehawk Cinema, Cayuga Capital, architecture firm ODA, and the Faherty clothing brand. There’s already wine aging from this year’s harvest — around 100 pounds of fruit total — that Village Vines will base an event around in the spring of 2019.